For decades, Block's standoff infrared detection products have been used to protect critical infrastructure in the National Capital Region and elsewhere. New developments in Quantum Cascade Laser (QCL) technology are now allowing Block to offer breakthrough increases in sensitivity, speed, and detection distance. Block Engineering's LaserWarn is an open-path gas detection system that was developed to save lives and protect personnel from chemical attacks. The system is designed to protect transportation facilities, embassies, military bases, government buildings, malls and other vulnerable critical infrastructure. LaserWarn identifies Chemical Warfare Agents (CWAs), Toxic Industrial Chemicals/Materials (TICs/TIMs) and other hazardous chemicals. 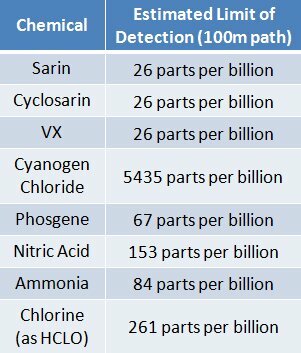 The LaserWarn system can detect chemical threats — including Sarin, Tabun, VX, and Cyclosarin gases — in parts-per-billion (ppb) ranges from standoff distances of hundreds of meters. The system registers warnings in seconds, allowing for rapid response to threats. The LaserWarn can be permanently installed for security monitoring of buildings, hubs, and large-capacity crowd venues — or it can be carried as a lightweight, portable system for First Responders. In permanent installations, the system is set up with a series of low-cost mirrors and retro-reflectors. Eye-safe infrared lasers create a detection path that blankets the area of interest. When a gas cloud crosses that laser path, a detection is sensed and a signal sent to the building control center. The system operates 24/7, and unlike conventional networks of point sensors, the LaserWarn requires no regular maintenance or specialty cooling methods. False alarms can be eliminated because the system collects background information continuously as a function of time of day, day of week, and season so it is not confused by typical background chemistries. The system is designed for both indoor and outdoor operation. In portable applications, the gas detection system is hand-carried to a target location. First Responders introduce reflectors into the "hot zone" and the target area can be tested for chemical contamination from a safe distance. The LaserWarn can be quickly mounted or dismounted from a standard tripod for maximum flexibility. The LaserWarn standard detection range is a 500 meter round trip path. Utilizing QCL-based infrared absorption spectroscopy technology, the gas detection system provides rapid response times of 1 second or less. LaserWarn can easily interface with most security systems via ethernet, wireless, or cellular communication methods. 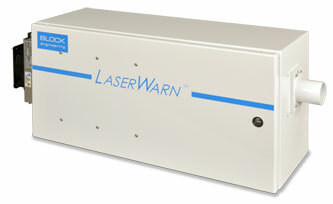 Compared to existing IR and FTIR open-path detection systems, the LaserWarn offers significant improvements in speed, sensitivity, detection distance, and ease-of-use. If you would like to discuss how our open path gas detection system can help with your application needs, please contact us.